Quick overview The Greek myths contain some of the most thrilling, romantic and unforgettable stories in all human history - and here they are brought to life in a vivid retelling. The Greek Myths contains some of the most thrilling, romantic and unforgettable stories in all human history. 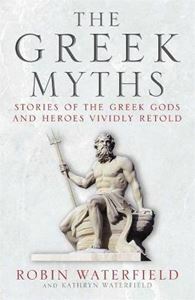 From Achilles rampant on the fields of Troy, to the gods at sport on Mount Olympus, from Icarus flying too close to the sun, to the superhuman feats of Heracles, Theseus and the wily Odysseus, these timeless tales exert a fascination and inspiration that have endured for millennia. There are few people as steeped in the Ancient World as Robin and Kathryn Waterfield, and in their hands the heroism, humour, mystery, sensuality and brutality of the Greek Myths are brought brilliantly to life.